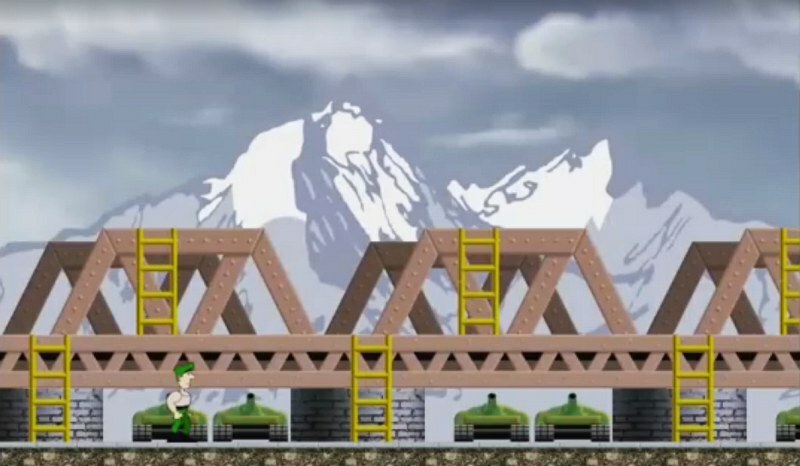 Indie Retro News: Green Beret retro classic gets a 2016 PC remake footage tease! Green Beret retro classic gets a 2016 PC remake footage tease! You may or may not remember the name Langford Productions, but that developer was behind the previous enjoyable remakes such as Cookie, Pssst, Pyramid, Jumping Jack, Automania and The Hunch. Each one from the ZX Spectrum that was given a rather cartoony look, with original graphics included and made fully playable on the PC. So after all those were announced I gave Langford Productions a task, could the developer remake the famous game ' Green Beret '! Which was one of the most difficult action platformers I have ever played on the Amstrad CPC 464. Sure enough, today we got the first tease for the Green Beret Remake, and so far it's looking pretty decent! Now funnily enough, it was only since the two other remakes were being teased such as Frank 'n Stein, that I happened to ask what happened to this remake and did he give up. he response was basically that he was struggling with the graphics, as he was used to the cartoon look rather than the realistic ones in the original game. So as a nudge to carry on, I just said to go with it and use the cartoon look characters. Thus today, we have the first look at the game with actual frame rates of 60fps, not the video which is showing 30. Current release date is TBA as there is a long way to go yet!